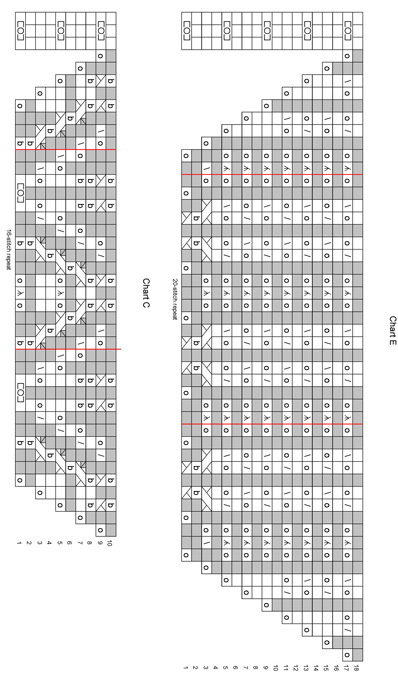 Each chart shows only the stitches between markers 1 and 2 and the centre “spine” stitches. The chart must then be repeated across the stitches between markers 3 and 4. 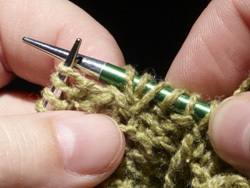 When a yarnover is followed by a purl stitch, do not wrap the yarn around the needle. Simply take yarn to the back and work the purl stitch, allowing the yarn to lay over the needle. Hb yo - Horizontal bar yarnover - with right needle, pick up 3rd stitch on left needle and pull over 1st and 2nd stitch and drop, creating a horizontal bar under the stitches, then k1, yo, k1. Inc3 (Used in flower bud motif) - Increase 3 stitches in the next loop as follows: K1 in to purl bump three rows below, K1 in to the purl bump two rows below. 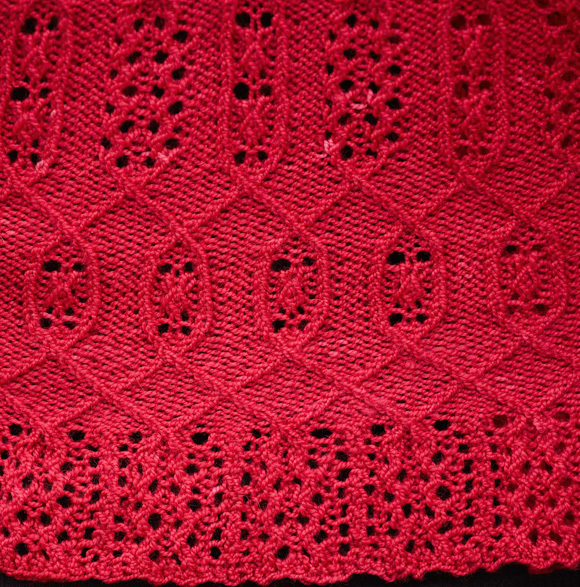 K1 in to the purl bump three rows below. 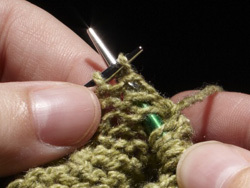 Drop original stitch off left needle and let stitches unravel. 1. 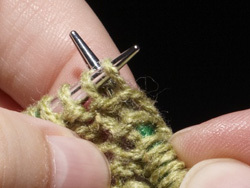 Knit 1 stitch inserting your needle under the purl bump three rows below the stitch on your left needle. Draw new stitch through. 2. 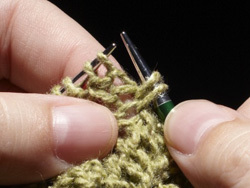 Knit a second stitch by inserting your needle under the second purl bump below the stitch on the left needle. 3. Draw new stitch through. 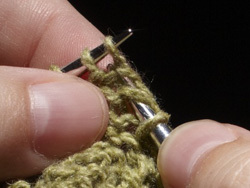 There are now two stitches on the right hand needle and the original stitch is still on the left needle. 4. 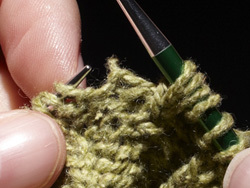 Now knit a third stitch by knitting again under the third purl bump below the needle and draw off the new stitch. 5. You now have three stitches on the right hand needle and the original stitch on the left hand needle. off the left hand needle. 7. 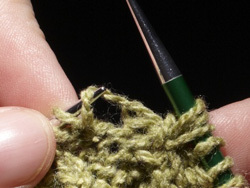 Let the stitches unravel down to the new stitches (you may need to assist them in doing this). 9. After working the sl2-k1-psso decrease, the stitch is completed. 10. The finished stitch looks like flower buds. Note: Be very careful when working the double decreases. Both s2kpo and sk2po are used, and there is a difference in how they look – make sure you use the right one. 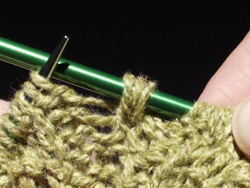 S2kpo – Slip 2 stitches together as if to knit, knit next st, pass 2 slipped stitches over stitch just knit. Sk2po – Slip next stitch as if to knit, k2tog, pass slip stitch over. C2bp – Slip next st to cable needle and hold in back, k1tbl, p1 from cable needle. C2fp – Slip next st to cable needle and hold in front, p1, k1tbl from cable needle. C3 - Slip next st to cable needle and hold in front, slip following stitch to cable needle and hold in back; ktbl next stitch, knit stitch from cable needle held in back, ktbl stitch from cable needle held in front. C3p – Slip next st to a cable needle and hold in front, slip following st to a second cable needle and hold in back; k1tbl, p1 from cable needle held in back, ktbl stitch from cable needle held in front. 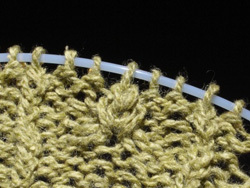 Instructions for the Knit Lace Bind-Off can be found here (middle technique). Cast on 3 stitches and work in garter stitch until 9 ridges have been completed (18 rows). With right side (RS) facing, knit across the 3 stitches on your needle. Turn work 90 degrees clockwise and pick up and knit a stitch in the edge of each garter stitch ridge. Turn work 90 degrees clockwise and pick up 3 stitches in the cast on edge (15 stitches). Turn work so wrong side (WS) is facing. Setup row [WS]: K3, pm, p3, pm, p3, pm, p3, pm, k3. Row 1 [RS]: K3, work 5 sts of row 1 of Chart A between first two markers, 3 stitches of spine between second and third markers, and repeat the first 5 chart sts again between the third and fourth markers, k3. Row 2 [WS]: K3, work 5 sts of row 2 of Chart A between first two markers, 3 stitches of spine between second and third markers, and repeat the first 5 chart sts again between the third and fourth markers, k3. Continue in pattern as established until Chart row 42 is complete. At the end of the Chart A you should have 45 stitches between markers 1 and 2 and between markers 3 and 4. 99 stitches total. Work each chart once in order: the 44 rows of chart B1, then the 44 rows of chart B2 and then the 24 rows of chart B3. Continue to work k3 at the beginning and end of each row. Note: If you wish to make a larger shawl, work an extra repeat or two of the 44 row repeat in this section. If a larger size is worked, additional yardage will be required. 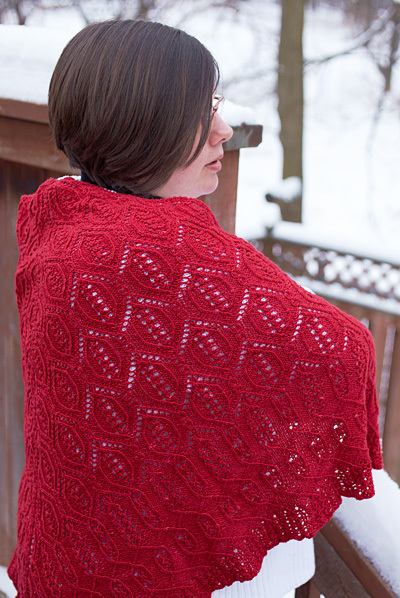 To make the shawl smaller, work fewer repeats. If you adjust the number of repeats, make sure you end on row 24. After Charts B1-3 are complete you will have 157 stitches between markers 1 and 2 and between markers 3 and 4. 323 stitches total. Work chart C once, continuing to work k3 at the beginning and end of each row. Note: Work this section with extra care. 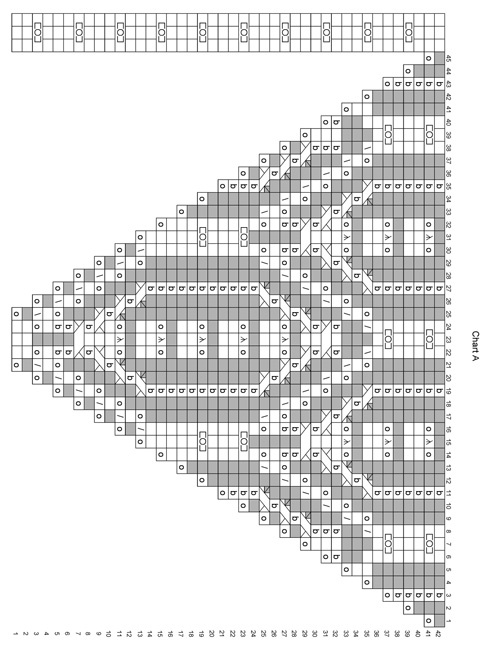 The stitch pattern is close to the one in chart B but this section of chart handles the transition to the new stitch pattern in chart D, and there are differences. At the end of Chart C, you should have 167 stitches between markers 1 and 2 and between markers 3 and 4. 343 stitches total. 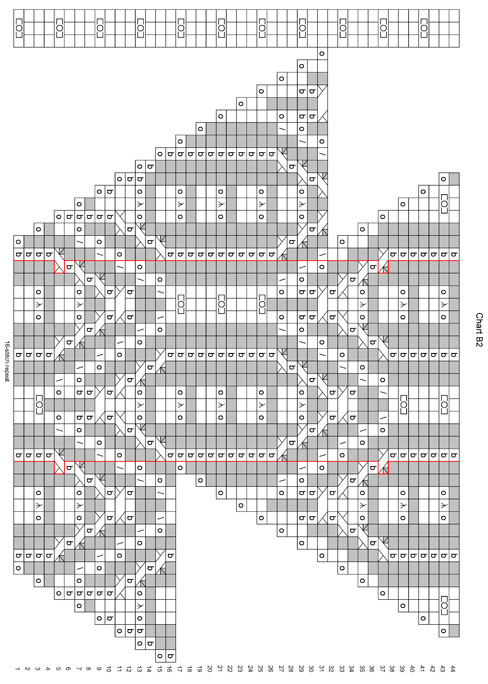 Work Chart D1 once, then D2 once, continuing to work k3 at the beginning and end of each row. 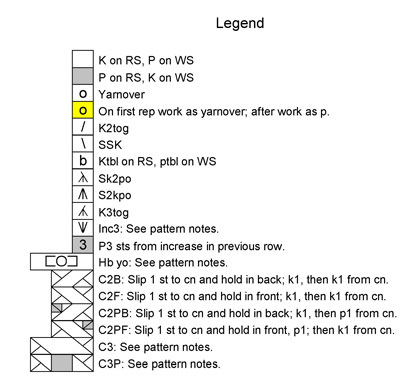 Note: As indicated on the chart legend, the first stitch of chart D1 is a yo. For subsequent stitch repeats, work this stitch as a purl. 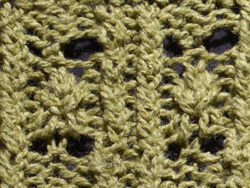 Note: See the pattern notes for instructions on working the stitches that create the flower buds (comprised of the inc3, p3 and sk2po over three rows). 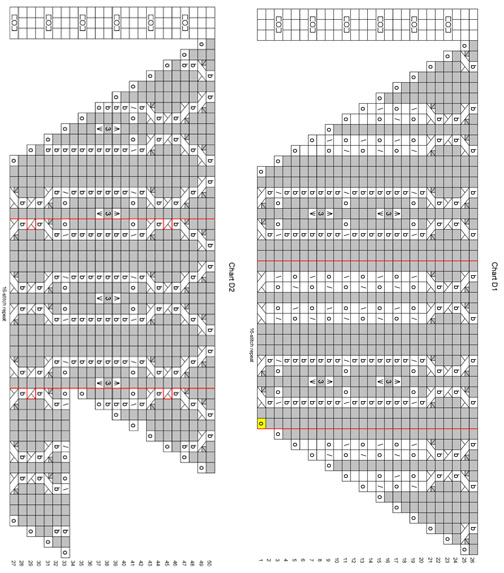 At the end of Charts D1 & 2 you should have 217 stitches between between markers 1 and 2 and between markers 3 and 4. 443 stitches total. Work Chart E once, continuing to work k3 at the beginning and end of each row. At the end of the Chart E you should have 289 stitches between between markers 1 and 2 and between markers 3 and 4. 587 stitches total. Bind off loosely with RS facing using the Knit Lace Bind-Off; however, instead of working the bind-off entirely in knit, purl the purl sts and knit the knit sts as they present themselves. Weave in all ends. 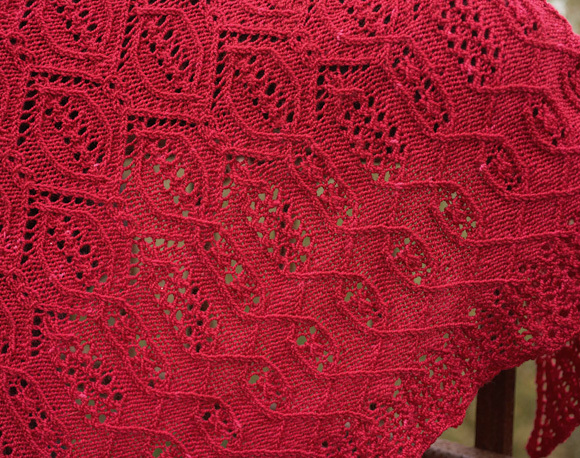 Soak shawl in lukewarm water with a wool wash until the yarn is thoroughly saturated. Roll shawl in a towel and gently squeeze to remove excess water. Stretch piece to desired measurement and pin in flat to dry (it is highly recommended that blocking wires be used for this). Do not unpin until completely dry. 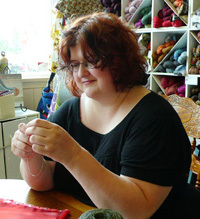 Janelle has been an avid knitter for the past 27 years but has only recently started designing and writing patterns. Her current fascination is with Japanese Stitch Patterns. 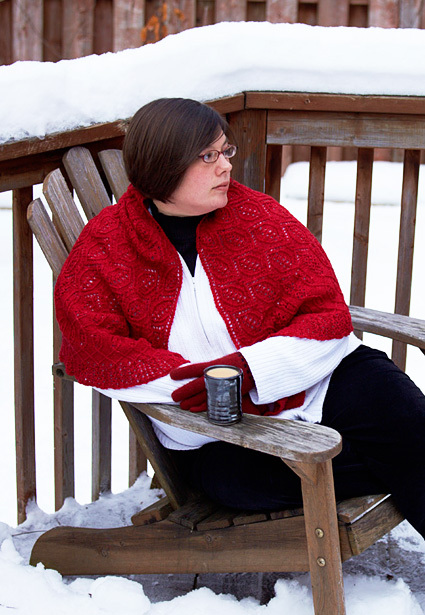 She lives in Waterloo, ON, Canada, and rarely goes anywhere without a book and her knitting. 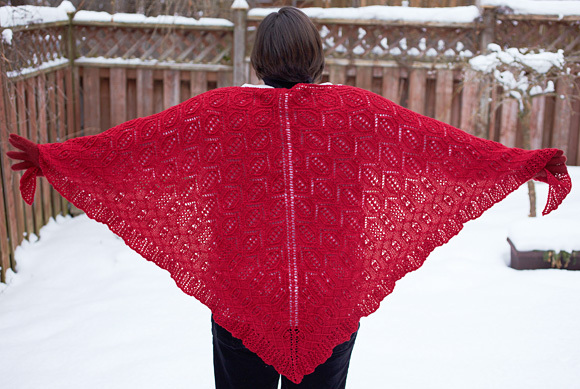 You can find her designs on eclecticcloset.ca and she’s Antheras on Ravelry.